Ted Takasaki talks about choosing the right landing net. Dangerously heavy, pulling straight down below the boat, it refuses to rise within visible range. The line strains, the rod creaks, forearms ache and a bead of sweat rolls into your eye. Not a good time to wonder if your net will hold up. Selecting a net seems simple enough. You stroll into a major tackle outlet, picturing a wall bender sliding into your new net, and there it is: The mesh jungle. Nets for muskies, salmon, trout, bass, and walleyes, nets with huge baskets, small ones, long ones, skinny ones, and some that function like Rubik’s Cubes, all spread out before you like chain link around a baseball field. Without question, a poor net-buying decision can cost you the fish-of-a-lifetime. It will tangle hundreds of fish in miles of nylon with dozens of trebles. It steals fishing time, causes delayed mortality and costs hard-working weekend heroes chances to win local tournaments. Few people have invested more thought and consideration to nets than professional angler Ted Takasaki, International Freshwater Hall of Fame legendary angler and winner of the 2012 South Dakota Governor’s Cup. The species of fish you’re going after determines the hoop size you need. Some nets are species specific, and so designed to solve the end-game problems each species of fish presents. 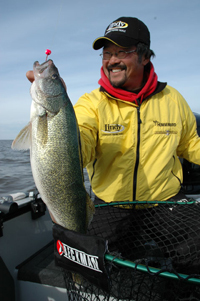 For walleyes, the hoop should be big enough for a 30-incher, according to Takasaki. He suggests considering the biggest possible fish you can catch and using that as your top-end hoop dimension. “It doesn’t need to be 30-inches wide, though. At 22-inches wide and 28-inches deep, my Beckman Walleye Special could envelop, lift and land a world-record walleye,” he said. But how many people are after trophies or fish in waters where many trophies are caught? Certainly not the majority of anglers, but it’s best to prepare for success than to come up short when it happens. Takasaki solves this dilemma by keeping two nets handy, one for what he expects to catch and a bigger back-up that won’t fail when a giant is on the line. Cheap nets kill fish, and serious anglers can’t afford to leave a trail of damaged specimens behind. 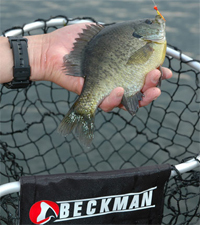 Anglers and fishery managers debate the questions of mesh size, which material removes the least protective slime, and which style provides the most efficient release. Of utmost importance is getting the fish in the boat without injuring it. We want to release them unharmed or get them to the scales and back into the water alive. A trophy fish with broken fins and a shredded tail results in poor photos, too. Another point of contention is handle length. Takasaki prefers the longest extendable handle available. Features like a detachable hoop and extendable handles mean storage of these longer nets is as easy as shorter ones. When it comes time to use the net, Takasaki says to hold it in one hand and the bag of the net in the other. Net fish headfirst and always shoot for a spot about 8 inches in front of the head. A classic netting mistake is to aim for the fish itself, but like shooting a crossing duck, you have to aim for where it will be, not where it is right now. Slip fish into the net in with a steady motion rather than jabbing at it. A steady scoop and lift works best, and a big hoop helps. You have less margin of error you want the fish’s head to go right into the center of the hoop. Takasaki says that most people don’t scoop deep enough or far enough, and this can cause a few moments of intense activity to get a big fish into netting position again. The right net can bring a new personal best into the boat, or just make a day go smoothly. Either reason is solid enough to put some time into your buying decision. The species of fish you’re going after determines the hoop size you need. Some nets are species specific, and so designed to solve the end-game problems each species of fish presents. Slip fish into the net in with a steady motion rather than jabbing at it. A steady scoop and lift works best, and a big hoop helps. Takasaki says that most people don’t scoop deep enough or far enough.